Officials examine the main entrance of the U.S. consulate Monday following a suicide bomb attack in Peshawar. Islamabad, Pakistan (CNN) -- A terrorist attack near the U.S. Consulate in Peshawar, Pakistan, killed two consulate security guards and at least six others Monday, authorities said. The two consulate employees who died were Pakistani, the U.S. Embassy in Islamabad said, and "a number of others were seriously wounded." At least eight people were killed in all, a government official said. All U.S. citizens were accounted for, and some had minor injuries, State Department spokesman P.J. Crowley said. The coordinated attack involved a vehicle suicide bomb and attackers who tried to enter the consulate by using grenades and weapons fire, the U.S. Embassy said in a statement. The blasts in the capital of the North West Frontier Province came hours after a suicide attack killed at least 30 people and wounded 50 others in another part of the province. The Pakistani Taliban claimed responsibility for both attacks. In a phone call to CNN, Azam Tariq, spokesman for Tehrik-i-Taliban Pakistan, said the group was behind the attacks in Peshawar and Dir. The U.S. Embassy, in its statement, said the two attacks reflect "the terrorists' desperation as they are rejected by people throughout Pakistan." Peshawar is about 75 miles (120 kilometers) from Islamabad, the country's capital. Bashir Ahmad Bilour, a senior provincial minister, told reporters at the scene that several militants came in two vehicles. The first vehicle exploded near a security checkpoint, and gunmen in the second car opened fire. 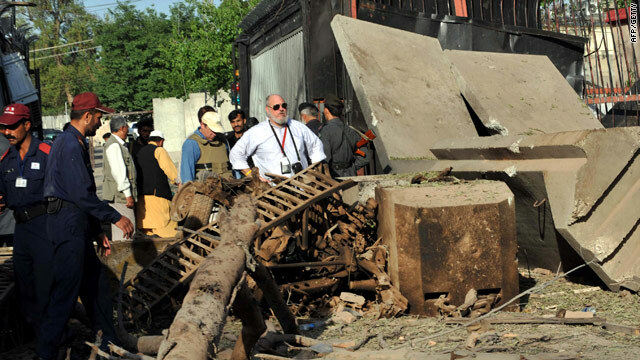 The dead included two Pakistani security personnel working for the U.S. Consulate, one policeman, two civilians and three unidentified bodies, said Karim Khan, a senior police official in Peshawar. "They were well-organized. They were well-equipped," he said of the attackers. The three explosions went off within a span of 15 minutes in the area of Saddar and Hayatabad Avenue, near the American consulate and the Peshawar headquarters of Pakistan's intelligence agency, which was the target of a deadly car bomb attack in November. The North West Frontier Province is rife with Islamic extremists and has been the site of recent clashes between Pakistani security forces and militants. Monday's earlier suicide attack took place at a rally for the province's ruling Awami National Party in Timargarah in the lower Dir district, said lawmaker Mehmood Zeb Khan. Hundreds of the participants had gathered for a rally to change the name of the province to Khyber Pakhtunkhwa. The bomber walked into the government building where the meeting was going on and blew himself up, said provincial spokesman Mian Iftikhar Hussain. The province was given its current name during the British colonial rule. The party, which heads a coalition government in the province, wants the area's name to reflect its majority Pashtun population. A bill to amend the constitution in support of the name change was expected to be introduced in parliament on Monday. Journalist Nasir Habib and CNN's Elise Labott, Paula Newton, and Jill Dougherty contributed to this report.